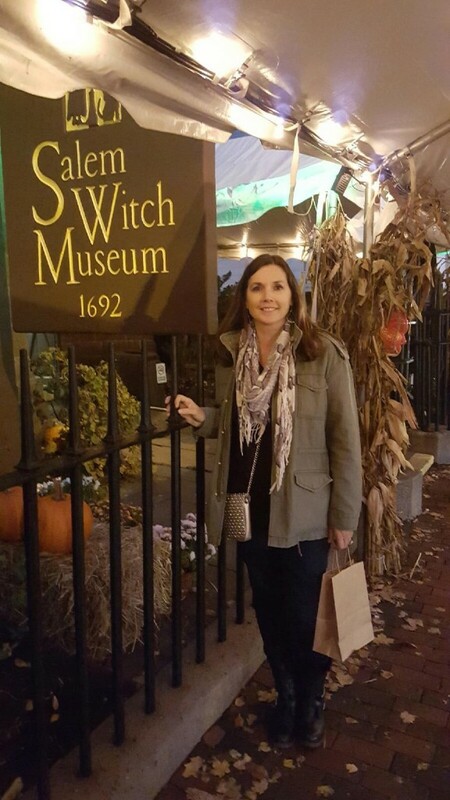 I got to spend Halloween 2015 in Salem, Massachusetts. I have always wanted to go to Salem; it was on my bucket list for a million reasons, but mostly because I have always felt a certain kinship to the misrepresented women and men of the Salem Witch Trials. My friend/soul sister Jennifer had been there a year before and returned with stories, spirit bells and all kinds of magical goodies that stirred my wanderlust even more. I trust Jen’s sense of knowing implicitly, so when she told me I had to go, I had no choice. I had to go. When we decided to make the trip in grand style and go over Halloween weekend we knew it would be life changing. We also knew if we trusted our own ability to manifest amazing things compounded with the magic of Salem, crazy good things would come. We decided we would trust the universe and “yes to everything”. From our plane tickets, to finding the last room available, every part of our trip fell in place. We had hoped to go to the “Official Salem Witches Ball” and of course the tickets had sold out. Jen’s husband transformed into the tenacious travel agent and as expected another little miracle got us two tickets to the hottest party of the weekend. The entire journey became one little miracle followed by another. Spirit kept reminding us repeatedly that we were exactly where we needed to be. We went through the Witch Museum and into several of the magic shops, each filled with visitors bumping into one another, making it challenging to get a good look at what each location had to offer. Everyone was kind and respectful but the word “crowded” does not do the story justice. Wall to wall, spiritual sardines…you get my drift. The energy of the town is crackling, the streets are shoulder to shoulder with people and it all seems to amplify by the minute. We made our way down the main corridor and at the far end we came across “Tibetan Arts and Healing”. Of course we had to go in. From the moment we walked through the door it felt completely different from any other shop in Salem; it was so peaceful. The music and smell of incense brought a sense of calm immediately. The shelves were filled with gorgeous jewelry, singing bowls, malas, statues and beautiful Tibetan antiques. Everything about the space felt as though it had been placed there just for me, it was everything I needed to ground and quiet my spirit. It was like stepping through a looking glass into a parallel universe, quite opposite of the chaos outside. We were over the moon as we picked up and tried on no less than fifty different pieces of jewelry. We found a bowl of rings on the counter that were large and bold, and of course there were only two that fit each of our fingers perfectly. As we checked out I watched the owner of the store wrap each item carefully, as though each was delicate and sacred. He told us his culture was one of giving and insisted each customer receive a gift before we left. Tucked into my bag was a small wall hanging with a quote from the Dahli Llama that I had never read before. His kindness was simple, lovely and precious. My friend Jen paid for her items and as they exchanged money she asked him if the Halloween weekend got to be too much? The small peaceful man stood for a few seconds in thought and then he replied simply, “There are so many good people.” He smiled and found her some prayer flags and thanked us for coming to his store. He had no idea the impact that exchange had on my friend and I. His words stopped me dead in my tracks and I was humbled to be in the presence of someone who was truly living his beliefs. Those words and that moment seemed to be the cosmic cherry on the cake that we had hoped for that weekend. To say I fell head over heels in love with him, and his shop and is an understatement! If I could bottle him and the energy of his shop and bathe in it everyday I absolutely would. His kindness and generosity were genuine and pure, something I can only hope to emulate in my life. There are so many good people!!! In light of all the recent world tragedies we need to remember it now more than ever. I say those words to myself now over and over everyday, they just feel right to my soul. After a million more magical moments and a train ride into Boston we ended up returning to the Tibetan Store the evening before we left. The fact that it was open late on a Sunday evening was just one more amazing coincidence that we celebrated as significant and perfect! We found more wonderful things to bring home and the owner’s son again shared the act of gift giving before we left the store. He too shared the kind spirit of his father and made our last evening in Salem a cherished one. I have so many stories from our Salem experience and I feel like I might over use the word magical, but there really isn’t any other way to describe so much of what happened. It was magical my friends, and when you ask for big magic it really does happen! I am forever changed and forever grateful the words of the little Tibetan Buddhist man that are now etched into my memory. Below is the quote from the wall hanging he gave to me which now hangs proudly in my home. During that period, we must try to do something good, something useful with our lives. If you contribute to other people’s happiness, you will find the true goal.